Leading Manufacturer of RoboV4.0, Robo V3.1, RoboV3.0, RoboV2.0, RoboV1.0 and Rear wheels for Razor Ground force Electric go kart from Bengaluru. With simple mechanical structure, easy for installation.Adopts 4 geared DC motors, ensuring flexibility and good direction.With large and stable Chassis, easy for expansion. With simple mechanical structure, easy for installation. Adopts 6 geared DC motors, ensuring flexibility, good direction along with 1 axis gripper arm. With large and stable Chassis, easy for expansion. Adopts 4 geared DC motors, ensuring flexibility and good direction. Set of two rear wheels for the Razor® Ground Force electric go-kart. These rear wheels are not compatible with the Ground Force Drifter electric go-kart. 24VDC 200W electric scooter motor. Powerful four brush permanent magnet electric motor design with 100% ball bearing construction. Includes 11 tooth sprocket for #25 chain. 17" long power leads with 1/4" push-in connectors. Shaft rotation reversible by reversing power leads. Dimensions: 4" wide x 3" long excluding shaft, 4-1/4" long including shaft. Mounting bracket measures 4-3/8" x 2-1/4" with 4 threaded mounting holes. Weight 1.74Kg. Rear plastic electric scooter wheel with solid flat-free urethane tire for electric scooters. Includes chain sprocket, two wheel bearings, axle, axle adjusters, and mounting hardware. 5-1/2" OD, 2-1/8" ID. 4 bolt mounting pattern. Bolts directly onto rear wheel freewheel clutches. This small air conditioning the shopkeeper DIY finished, the use of electronic refrigeration, suitable for a small space and a small area of cool! 7-3/8" OD, 2-1/8" ID. 4 bolt mounting pattern. Bolts directly onto rear wheel freewheel clutches. Built-in variable speed controller works with any 5k Ohm throttle or potentiometer to vary the speed of motor from full stop to full forward. 2800 RPM at full speed. Counter clockwise shaft rotation facing shaft. 8mm OD D-shaped output shaft. 3-bolt mounting pattern. These are the same type of electric motors that Currie, Lashout, and USPD Pro-Drive electric bicycle kits use however they are not compatible with those bikes because they rotate counter clockwise instead of clockwise. These motors are popular with electric scooter and bicycle builders and experimenters. Electric motor with bicycle chain sprocket and mounting plate for eZip® and IZIP® electric bicycles. This is the exact same motor that is listed above with the addition of a heavy-duty mounting plate attached to it. A DC motor is a mechanically commutated electric motor powered from direct current (DC). The stator is stationary in space by definition and therefore its current. The current in the rotor is switched by the commutator to also be stationary in space. This is how the relative angle between the stator and rotor magnetic flux is maintained near 90 degrees, which generates the maximum torque. A servomotor is a rotary actuator that allows for precise control of angular position, velocity and acceleration. It consists of a motor coupled to a sensor for position feedback. It also requires a relatively sophisticated controller, often a dedicated module designed specifically for use with servomotors. A Stepper motor is an electromechanical device which converts electrical pulses into discrete mechanical movements. The shaft or spindle of a Stepper motor rotates in discrete step increments when electrical command pulses are applied to it in the proper sequence. The motors rotation has several direct relationships to these applied input pulses. The sequence of the applied pulses is directly related to the direction of motor shafts rotation. The speed of the motor shafts rotation is directly related to the frequency of the input pulses and the length of rotation is directly related to the number of input pulses applied. 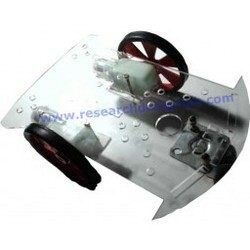 These wheels can be used in various wheeled robots with the motors having 6mm shaft. Clamps are the fundamental chassis parts. You can fix your motors with these clamps according to your own wish; based on the type and size of the base you decide to make of the bot. The Fire sensor, as the name suggests, is used as a simple and compact device for protection against fire. The module makes use of IR sensor and comparator to detect fire up to a range of 1 - 2 meters depending on fire density. The LM35 series are precision integrated-circuit temperature sensors, whose output voltage is linearly proportional to the Celsius (Centigrade) temperature. The LM35 thus has an advantage over linear temperature sensors calibrated in ° Kelvin, as the user is not required to subtract a large constant voltage from its output to obtain convenient Centigrade scaling. The LM35's low output impedance, linear output, and precise inherent calibration make interfacing to readout or control circuitry especially easy. Module triple output mode, digital output is simple, analog output more accurate, serial output with exact readings. This is a simple-to-use liquefied petroleum gas (LPG) sensor, suitable for sensing LPG (composed of mostly propane and butane) concentrations in the air. Used in gas leakage detecting equipments for detecting of LPG, iso-butane, propane, LNG combustible gases. If output goes above a preset range the output is low else high in idle condition. The L3G4200DTR is a low-power, three-axis angular rate sensor, able to provide unprecedented usability of zero rate level and sensitivity over temperature and time.It includes a sensing element and an IC interface capable of providing the measured angular rate to the external world through a digital interface (I2C/SPI). Based on a simple basic Idea, this IR obstacle sensor, is easy to build, easy to calibrate and still, it provides a detection range of 10- 30 cm. This sensor can be used for most indoor applications where no important ambient light is present. It is the same principle in ALL Infra-Red proximity sensors. The basic idea is to send infra red light through IR-LEDs, which is then reflected by any object in front of the sensor. This sensor can be used to test the moisture of soil, when the soil is having water shortage, the module output is at high level, else the output is at low level. By using this sensor one can automatically water the flower plant, or any other plants requiring automatic watering technique. Module triple output mode, digital output is simple, analog output more accurate, serial output with exact readings. Set of two front wheels for the razor Ground force electric go start. Chiller power, water pumps, etc.Chiller surrounding essential with 8mm Advanced pump tube,Water-cooled device pass-through connector,Water cooling to deal with special insulation pipe. This product can be used in many fields, such as computer cooling system, Garden fountain, Aquarium, car cooling system, humidifier, air conditioner, and many other cooling and circulation systems.